The crucial final phase of General of the Army MacArthur's plan for freedom of the Philippines would culminate with the liberation of Luzon where the main Japanese force was located. Frustrating this plan was a Japanese radio station on the island of Mindoro that provided early warning for the enemy's anti-aircraft batteries, fighter planes and flak boats on Luzon of the approach of our planes that were based on Mindoro. 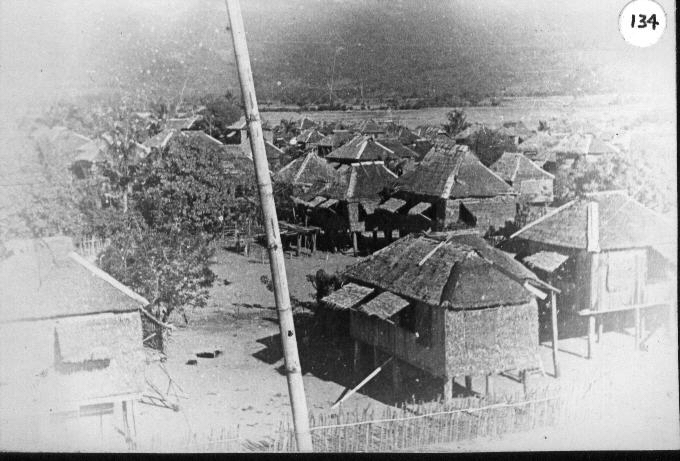 Since the Japanese radio station was located in the fairly large Philippine town of Paluan, it was not feasible to destroy the station by air attack or naval bombardment. 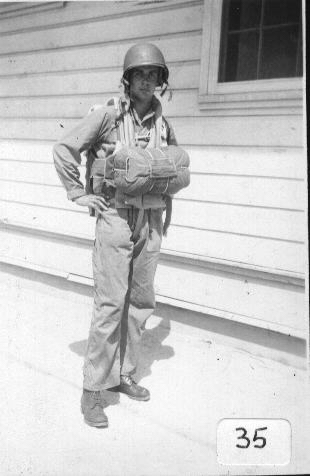 B Co, 503rd Parachute RCT, reinforced by a machine gun section, was chosen to land some distance south of the town, then hike up to attack and destroy the radio station and its complement of about 80 Japanese soldiers. B Company was landed shortly after midnight by a navy LCI on the coast of Mindoro some 20 miles south of the town of Paluan. However, when its captain saw a Japanese plane on a night with no clouds under a brilliant full moon he thought it was so dangerous to his ship that he backed off the shore before we paratroopers were all disembarked, dumping many of us in water so deep that we were relatively fortunate to have had only one of our 60 mm mortarmen drown. He and the other members of the mortar platoon were loaded down, in addition to their rifles and M1 ammunition, with either four or six mortar rounds (I'm not sure) or the mortar tubes, base plate, bipods and sights. At that time, Warren Pepper, our number one mortar gunner, put his own life in jeopardy by swimming out to save several other troopers who certainly would otherwise have drowned under the weight of their equipment. Pepper was much later awarded the Soldier's Medal. Max Kulick, a rifleman in our platoon, was able to take a number of pictures of the attack and its aftermath which is currently (in 2001) available on the internet at the website, www.thedropzone.org. As we hiked up toward the enemy station, my first platoon was in the lead. 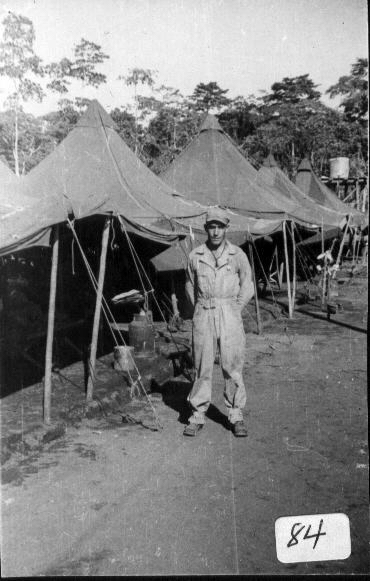 Ted Hoggatt (See Picture #56, below), our first scout, signaled that someone was approaching and the entire company rapidly moved off the trail into the bushes ready to open fire as we had quickly learned to do back in New Guinea I saw that it was a young Filipino whom Ted had seen and heard coming. I stopped him and found that he was a resident of Paluan, the site of the radio station, who had been forced to lead a patrol of Japanese soldiers coming south while we were going north on the same trail. The young fellow told me that he ran away when the Japanese stopped to put their shoes back on after crossing a stream. He warned me that they were just a few minutes away heading in our direction, that they were thirteen in number with a sergeant in charge, that they were all armed with rifles and grenades, and that one of them had an American Garand M1 rifle that had been picked up when American and Filipino forces were forced to surrender the Philippines in 1942. A lieutenant and a sergeant from our regimental headquarters had been coming along as "liaison" with six Filipino guerrillas, the leader of whom wore one of our old "tin hat" World War One helmets and armed with Enfield bolt action rifles that was the standard U.S. Army weapon before we adopted the "03" Springfield. Originally, they were supposed to be familiar with the area and in some way guide us, but they were constantly arguing with each other so our commanding officer, Capt. Chester Smith, had them tag along toward the end of the column so as not to impede our advance. When the Filipino came down the trail, the guerrillas took off into the bush, which was all right with us but not so good for the lieutenant and the sergeant because they must have thought they were on safari and had had the guerrillas toting their weapons. Now aware that there really was an enemy, they were trying to call the guerrillas back to get their weapons so we had to tell them to shut up. 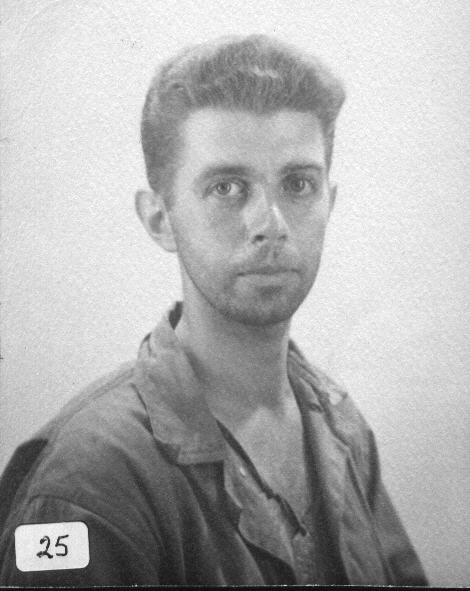 As we had done before in New Guinea and Noemfoer, we set up an ambush with Jim Pascarelli, the BAR man of the first squad, as the base for fire and to his left the BAR gunner from the second squad, "Press" Ferguson. Ted Hoggatt, Bill Prendergast, "Junior" Malo, and Bill Harris took up positions covering the trail with their rifles (See Picture #69, above). 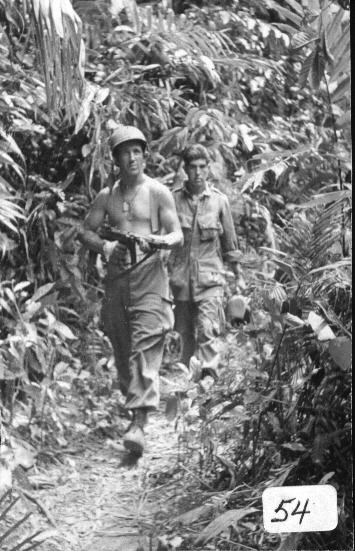 Sergeant Don Blum and I, both carrying Thompson machine guns, moved off to the right as far as we could to kill any of the enemy who might not be cut down by the BAR and rifle fire. I arranged that we would all open fire when Pascarelli, who had the best field of fire, did. We heard the enemy coming. The first in line was a very large soldier, wearing a white loose shirt, who turned out to be the sergeant. Pascarelli's first burst took down the first four or five of the enemy, Ferguson's BAR jammed,and the rest of the enemy party fell under our fire. Don Blum (See Picture #84, below) and I went in to be sure that there were no survivors who could pose a danger to us. We both happened to see the soldier with the captured U.S. Garand rifle as he had Don in his sights and pulled the trigger. For some reason, the rifle did not fire and I was able dispatch the enemy soldier in the next few seconds. As fate would have it, both Don Blum and "Press" Ferguson were to be killed the next day as we assaulted the radio station. While Captain Smith and we were getting ready to continue our march and talking about how fortunate we were that the Filipino youth had been able to give us information about the Japanese patrol, a captain, who clearly was not part of the 503rd, came up to me and said that I should have detained the young fellow. We were all rather high spirited about what had happened so we were not surprised when Ted Hoggatt said, "We were busy killing Japs. Where the f___ were you, sir? " Captain Smith evidently chose not hear that and the "foreign" captain backed off. Someone said later that he was CIC (Counter Intelligence Corps) which did not mean a thing to us. By nightfall we had arrived at the outskirts of the settlement of Paluan, which was in two neighborhoods about three-to-four hundred yards apart. 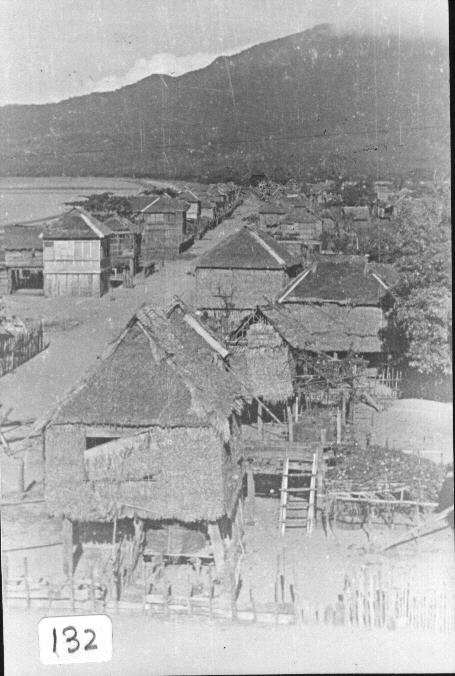 It was located at the apex of a very large bay, opening to the west, with a population close to a thousand living in three or four rows of "houses" built of local materials like bamboo and other natural products which made very comfortable residences (See Pictures #132 and 134, below). All were raised some five-to-six feet off the ground by thick wooden poles which allowed breezes and moisture to circulate. 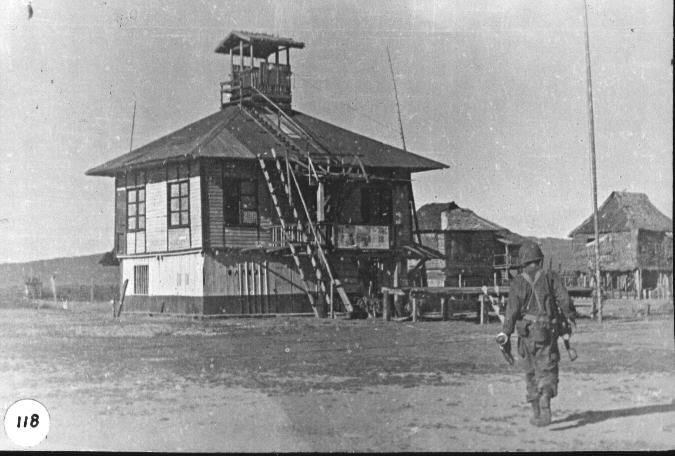 The Japanese had taken over the "new" school and the "old" school in middle of the north section of the settlement, which were in a line end-to-end at a right angle to and about 100 yards from the beach (See Picture #128, below). 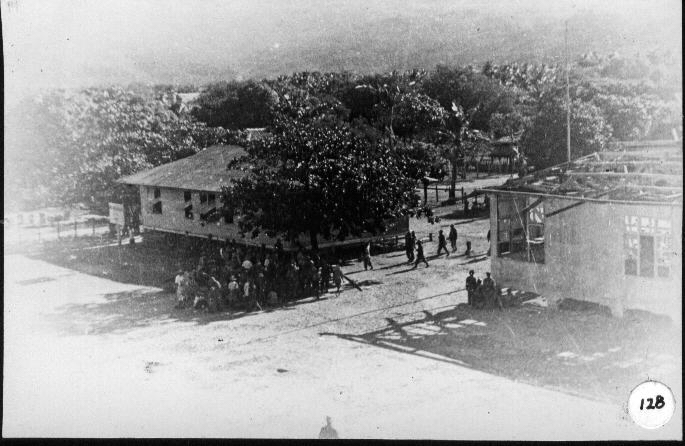 They faced out onto a former playground that had been turned into a parade ground and there was a new, small two-story building in which the radio was located (See Picture #118, below). That building also had a watchtower on the top where a lookout thereon had an excellent view seaward to sound an alarm in case of sighting any landing force. Picture #128: A view of the schools from the lookout post on top of the radio station. Picture #118: A view of the radio station with lookout post on the roof. We met about midnight to develop our plan which had my platoon entering the eastern part of the area two squads abreast and setting up close to the schools in which the enemy was sleeping. The light machine gun section took a position close enough to be protected by our left flank (See Picture #115, below). We were set up so that we and the machine guns would have raking fire over the parade ground. The third platoon was to set up to our right facing south onto the parade ground and schools, and the second platoon was to our south facing north but in cover so that they would not accidently be hit by fire from our third platoon. We were situated like a horseshoe with the schools, the radio building, the parade ground and the Japanese in our center, and the open side being the shore. The local people had told us that the Japanese garrison formed into ranks every morning at sunrise to say prayers to the Emperor on the parade ground. That was when our machine gun section and the first and third platoon would destroy the enemy. The Japanese had placed an ammunition "dump" several hundred yards north of the schools that was guarded by four soldiers. This target was given to our guerrillas to whom we had given adequate weapons. Captain Smith set up company headquarters a few yards behind my platoon and our 60 mm mortar platoon took cover a hundred yards behind us. The same old brilliant moon that caused us problems when we landed was still up there making the area very bright but we managed to get in place in the deep shadows of the houses despite the lookout on top of the radio building. As daylight started to break, we heard sounds familiar to any soldier, that was of the Japanese first sergeant getting his troops up and out. To our great dismay, there was firing off to our right alerting the Japanese in the schools who immediately took shelter under their buildings. The guerrillas had been seen by the Japanese guards at the ammo "dump" and had been fired upon, thereby alerting the entire Japanese force. Although we didn't have a specific target, we fired at the schools and the radio building for perhaps a minute. Ernie Larson, a rifleman in our first squad, stood up and took the classic position of a model target shooter. He squeezed off one shot, knocking the lookout over the side of his little box on top of the radio building, who then slid off the roof into a crumpled heap. "Just like Errol Flynn," laughed Ernie, as he took cover. The Japanese soldiers had constructed dugouts under each of the school buildings that were reinforced by thick logs. They had also prepared a maze of trenches they would have used in case of a seaborne attack that they were now manning to escape our fire. These preparations presented us with a formidable defense for the enemy while we could only take cover behind the logs that were standing on end supporting the civilian houses. 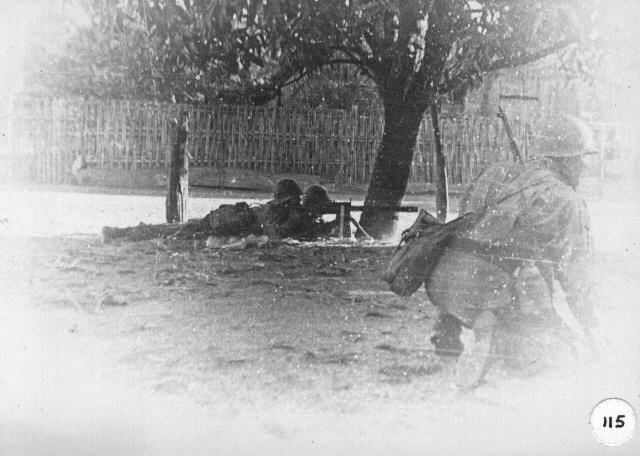 From under the schools, we started to take rifle fire which we were able to suppress, but then we came under heavy fire from a machine gun with us in the first platoon as the primary targets. Pascarelli spotted the machine gun and engaged in a kind of duel and was able to put it and its crew out of action. The next day when we came back into the area, we found that the machine gun was one of our own taken from a downed plane and with a very high rate of fire. On it were deep gouges where Pascarelli's bullets destroyed the enemy crew. We did not receive any more fire from that machine gun. However, that was too late for several troopers who had been wounded and Captain Smith, who had been shot in both legs. During what seemed to be a standoff, our third platoon, from houses that gave them the advantage of elevation, was able to pick off some of the defenders who were moving through the trenches. The second platoon cut off several attempts by the enemy trying to escape from the schools to move to the south. Sergeant Blum, Ferguson, and several other troopers, firing as they went, ran into the new school in an attempt to locate and destroy the enemy under the floor. Blum was killed, Ferguson wounded, and the other troopers forced out by heavy fire from under the floors. We had to get Ferguson out as soon as possible. 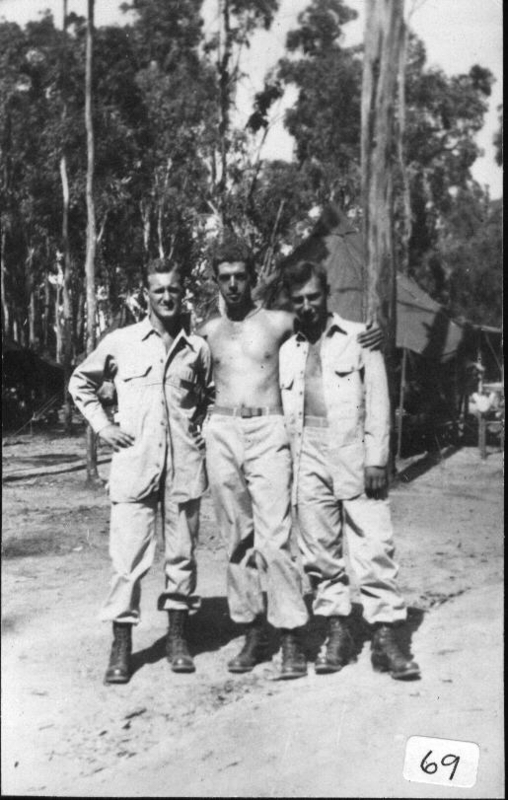 "Ted" Kaczor, from our mortar platoon who was a big strong guy, said he'd go in and get Ferguson, who was pretty large, too, while Ted Hoggatt, John Serba, "Junior" Malo and I would cover for them. Off we went, firing to prevent enemy fire from the dugouts. Kaczor (See Picture #54) came rushing down the steps practically carrying the wounded Ferguson when from under the building rolled a hand grenade that went off at our feet, killing Ferguson but leaving the rest of us, including Kaczor, unharmed. I've seen a lot of action but that memory of Kaczor hauling Ferguson down those steps while we were trying to protect them is one of the most vivid in my mind (See Picture #119). By mid-afternoon, I still hadn't seen any officer. Our platoon had lost some of our best people but we were trying small group forays and sniping where we thought we might have some effect. In a maneuver like that to get Ferguson, we stormed in and brought Don Blum's body out of the school with no opposition this time. However, our wounded, which now included Prendergast, also from our platoon, were not getting adequate treatment. The lieutenant from regimental headquarters assumed command, and ordered that we withdraw to the other smaller, southern sector of the settlement. Some of us thought that we shouldn't leave what we had fought to take. We did move out and set up a secure area where, after local people shared their food with us, we were able to really sleep well for the first time in several nights. PT boats picked up our dead and wounded. Among the dead was that sergeant from regimental headquarters. My first platoon had suffered most casualties: Sgt. Blum, Ferguson, Prendergast, Hoggatt, Larson, and several others. During the night the Japanese had abandoned their positions and the dozen or so survivors took off to the north. 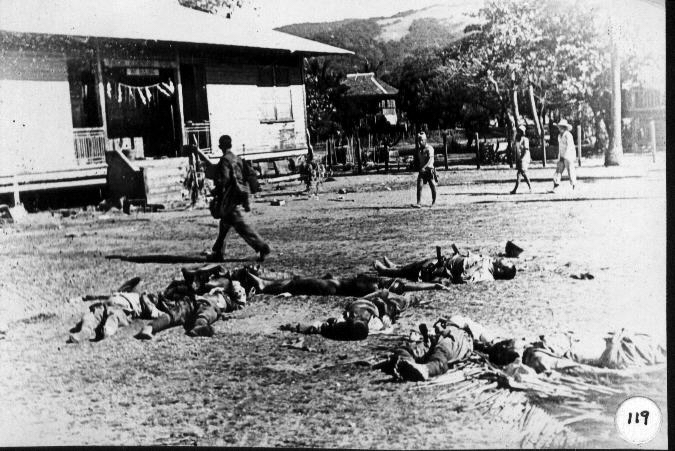 At daylight we went back to the scene of the fighting where the local people had already started to bury the dead Japanese. Our new commander gave me, with the remnants of my platoon, the assignment of pursuing the fleeing Japanese. 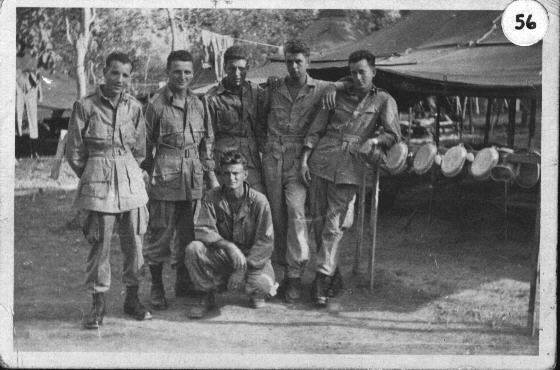 So the eight of us picked up water, extra canteens, c-rations, ammunition, and food from the rest of the company. With several local fellows to act as runners we took off after the Japanese with no more instruction than that. Over the next several days we learned that five of the Japanese had drowned in a boat trying to make Luzon, others were killed by Filipino guerrillas and the rest evidently lost in the jungle. About a week later I got word that some of us were to be picked up by a PBY navy seaplane, and several days later the rest of us were also returned to our base in Mindoro. Some say that our company had not quite recovered when we landed on Corregidor several weeks later. The lieutenant who took over command of B Company was killed on the island of Negros in June, 1945. Some of the "old timers" of B company said that it was not a totally bad thing. I was 22 years old then. I met Ted Hoggatt in San Francisco in June, 1945, as we were being sent home for discharge. I met Captain Smith at Fort Benning's Airborne School in 1951 when both of us were recalled to active duty for the Korean War. This time I was a lieutenant. Ted Kaczor was badly wounded on Corregidor in the attack on Water Tower Hill just a few feet from me, losing the use of his legs. He died within a few years. Max Kulick killed himself in 1950. So the war did not end for many of us in 1945. Max had an older sister in New York City who had been in touch with my mother, also in New York, during and after the war. Seems that Max never was able to reconstruct his life after he was discharged. Maybe, like me, he had a well-meaning uncle who told him that he'd been out of uniform "three weeks now" and ought to "get going" as a civilian. Three weeks seemed like a short time to be "back" after three years in the furnace of the Pacific. Hell, he'd spent three weeks in a hospital in New Guinea shivering from the chills and sweats of a "fever of undetermined origin." Maybe he couldn't see the future peddling frozen food door-to-door off the back of a truck, or being a "private investigator" for the Great Northern Detective Agency in Hackensack, New Jersey. He couldn't see the future after trying to tough out several miserable days on the Ford light truck assembly line in Fort Lee, New Jersey, or being a cub reporter for the Jersey Journal in Union City, New Jersey. Maybe he couldn't find a replacement for a home to return to since his sister's life had changed over three years. Maybe, at the end of the "52-20" unemployment program for former GI's ran out after a year, he couldn't find any replacement for the security of the company of fellow human beings who had shared the dangers of a shooting war and had even taught him to play double pinochle. Maybe he could not be comfortable except among other guys who all made the same wages. And maybe the faces and places in his extensive collection of hundreds of pictures that he had taken during his service possessed more reality and promise than his present life. So he went back to Australia which was more real and promising than his life in the big city. Some of his pictures, including one of Max himself, are preserved on the www.thedropzone.org web site in the year 2001. So it made sense to Max to go back to the place that had offered such positive feelings. My wife, Aiko, and I were doing some research for the Department of Justice and found Max's name on a ship's manifest when he returned to the U.S. in 1949 from Australia. Even that trip didn't work for Max. Death offered more promise and less pain than life. So he ended the pain. He was just as much of a casualty of war as was Sergeant Donald Blum. Max deserves a Purple Heart, too. This is a recounting of B Company's attack on Paluan and perhaps a little more but only from the perspective of a sergeant of the First Platoon. Each of our other platoons has a similar story to tell but no one has told them yet. I fear now in the year 2001 that no one ever will. I'm lucky to have been able to do so. "Ready for the Saturday Evening Post photographer"